Front Suspension Ø43 mm Öhlins USD, adjustable preload, compression, and rebound damping. Rear Suspension Öhlins reservoir-style twin shocks, adjustable ride height, preload, compression, and rebound damping. Triumph’s present Bonneville engine is a lot sweeter to use in everyday riding conditions. True, the 961 makes more power – and it is smile-making when it comes to overtaking traffic or belting along back roads – but then it is 961cc opposed to 865cc. It’s also fact the 961 engine deals out a lot more vibes and has a gearbox that wouldn’t be out of place on a proper classic. Gearshifts are slow and noisy and the needs a good solid movement of the foot to get top (fifth) gear to engage fully. 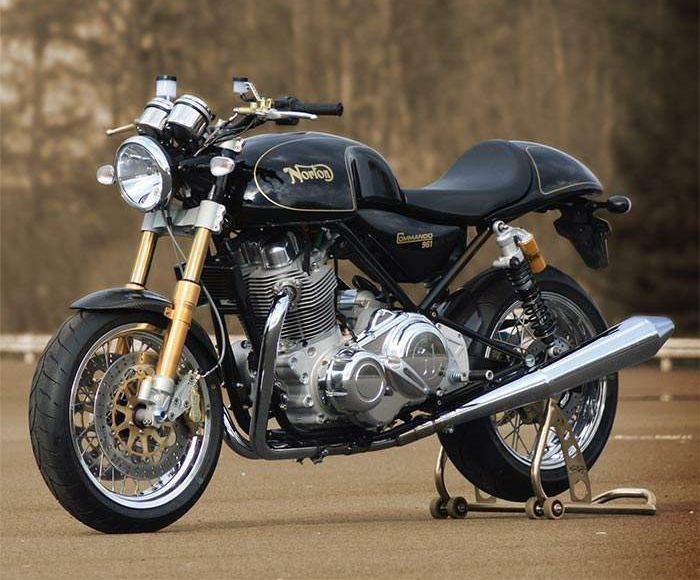 No doubt most owners will call it character and live quite happily with their treasured Norton – the bike they’ve always wanted. If this includes the weeping crankcase breather we encountered then so be it. 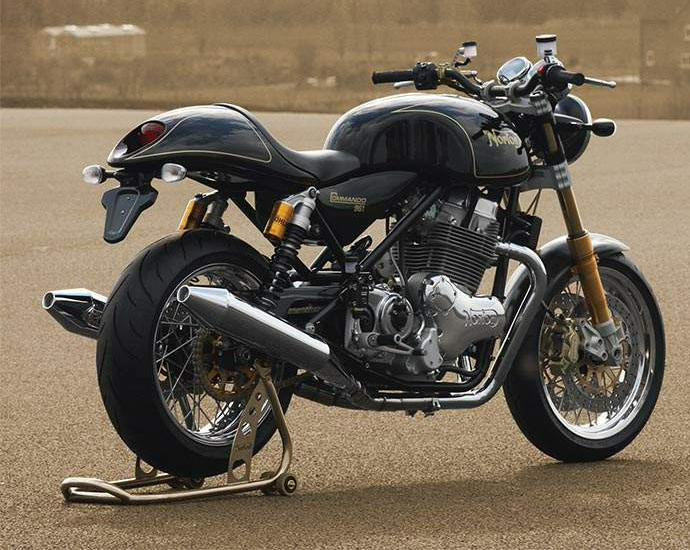 Of course Norton wouldn’t be Norton if the bikes didn’t have sports riding capability built into them as standard. Fortunately, the 961 is well up for a session or two of back road boogie. We can thank the sturdy frame, respectable chassis geometry and some of the tastiest chassis components your money can buy. Top of our list of bolt-ons is the Ohlins suspension front and rear. This is the sort of tackle that specials builders lust after. Billed as road/track, they suit the Sport very well. Any subsequent adjustment is purely to accommodate riding styles and rider weight. The Sport is super stable but doesn’t take much effort to cajole it through the bends – the chassis gifts the rider with feel and, therefore, confidence to seek out the next set of bends. 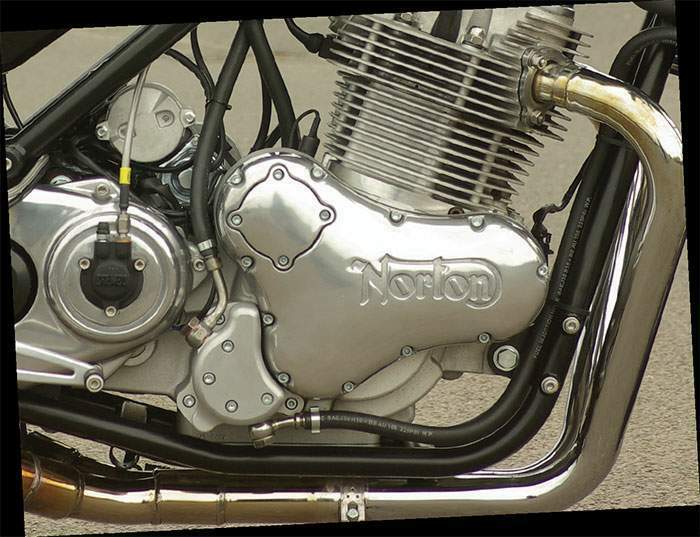 The old adage of ‘you’re paying for the name’ falls squarely across a Norton fuel tank. There are plenty of bikes out there that would run rings around a 961 Sport – probably two for the price of one – but then I guess we’d pay anything to own the bike of our dreams.